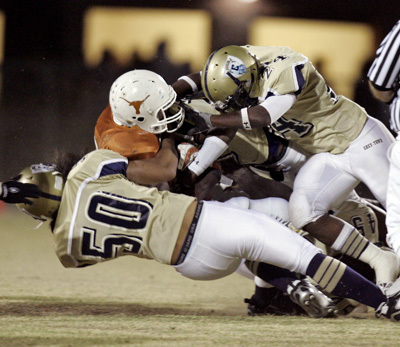 LOUIE TRAUB/REVIEW-JOURNAL Cheyenne defenders take down Legacy receiver Demetrus Hughes on a play during the Legacy-Cheyenne football game Friday, Oct. 10, 2008. If any questions about Cheyenne’s defense remained, they were answered at Legacy on Friday night. The third-ranked Desert Shields (6-1, 3-1 Northwest League) dominated the Longhorns, holding them to 110 yards of offense and handing them their first loss, 26-0. Sixth-ranked Legacy (6-1, 3-1) came in averaging 33.8 points and had scored at least 23 in all six games. But the Longhorns could not put anything together, managing only five first downs, with one coming in the second half. Legacy’s dynamic rushing duo of Deshae Edwards and Prince Oroke was unable to get going. Edwards entered as the area’s leading rusher with 1,016 yards, averaging 8.6 yards per carry. Oroke, a 215-pound fullback, came in with 744 yards and a per-carry average of 9.0 yards. 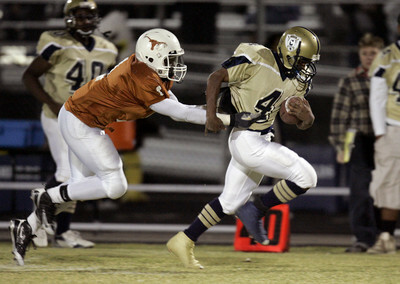 But Cheyenne limited them to a combined 90 yards, with 30 coming on one fourth-quarter rush by Edwards. Cheyenne’s defense even held after its offensive unit inexplicably went for it on fourth-and-8 from its 8-yard line in the first quarter. That decision gave Legacy possession at the Cheyenne 14, but the Longhorns managed only 4 yards and gave the ball back to the Desert Shields after failing to convert on fourth down. Proby said the defense didn’t feel added pressure in that situation, even though the game was scoreless. Cheyenne’s offense got off to a slow start but scored first on a 2-yard run by Ronnie Green with 9:53 left in the first half. The Desert Shields added a 1-yard touchdown run by Marcus Sullivan with 3:32 to go in the third quarter. Jordan Butler touched the ball only twice but scored both times on fourth-quarter runs of 4 and 1 yards. Sullivan finished with 101 yards on 19 carries. Green added 69 and Terrence Brison 57 as Cheyenne gained 253 yards rushing. The shutout was Cheyenne’s third, and the Desert Shields have allowed only 46 points, with 25 coming in their loss to top-ranked Palo Verde.